Projeto Interiores Cia. Art Culture. Photo: Disclosure. The beautiful art can have a theme and get a standard size. Is the artist to explore in depth their creativity and for her transit, with your thinking, by means of shapes and colors. Was this the intention of the art curator Paco de Assis, by proposing one more exhibition. The theme "interiors", suggested by the renowned art critic Oscar D ' Ambrosio, could be suggestive and diverse interpretations. 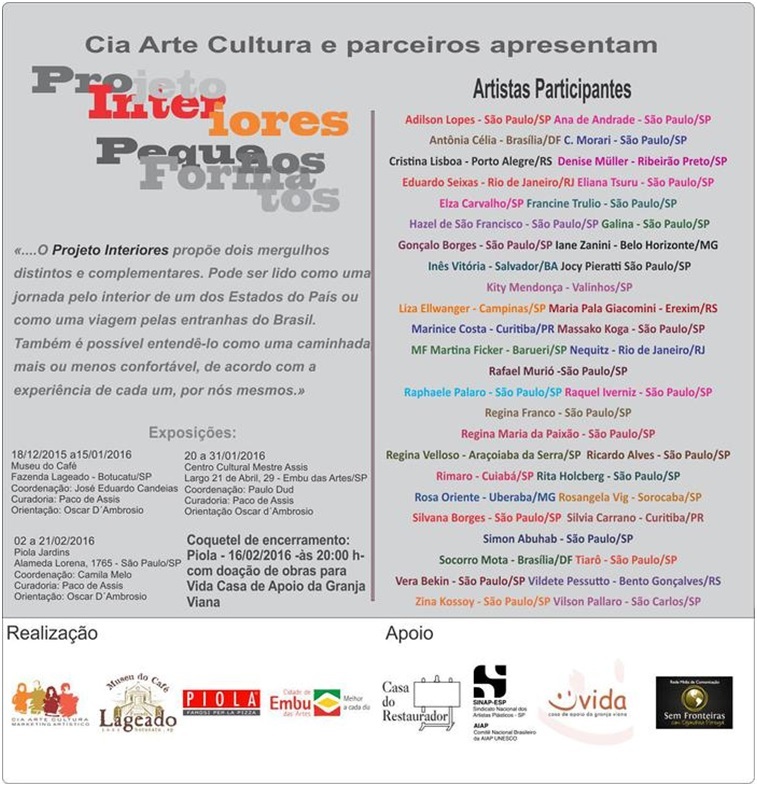 But the inspiration of artist followed with the idea ahead, taking colors and shapes to the coffee Museum, in Botucatu; the Cultural Centre Master Ahmed, in Embu das Artes; and now, to Piola, in the gardens, in São Paulo. 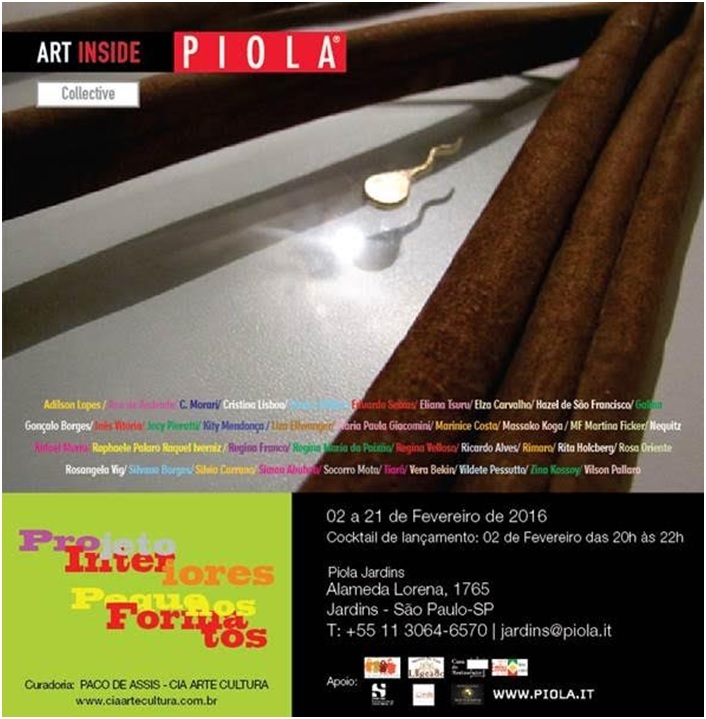 The series of exhibitions that began in December, followed by January and begin the last stretch, with vernissage, on 16 February, no Piola Jardins, in São Paulo, where the works of 42 artists are exposed to the day 25 February. The last part of the itinerary will be attended by artists and connoisseurs of art. But perhaps one of the most beautiful parts of the project, is donating most of the exhibited works, for life, Casa de Apoio da Granja Viana. Interior design proposes two distinct and complementary dives. Can be read as a journey through the interior of one of the country's States or as a journey through the bowels of Brazil. It is also possible to understand him as a walk, more or less comfortable, According to the experience of each, by ourselves. The fact is that the paths are pleasant Interiors and painful at the same time. Include peer into what we did, who we are and what we can be, whether it's a personal or collective sphere. Advance in what was built means reflect on what if hit and peer into where we want and we can get. It is, in whole, coexistence between what we want and what we can actually. Thus arises a restlessness that can earn a diversified plastic expression. This ability of each think and create is limited by the barriers that each places and according to your interests, conditions and capabilities. The distance between what we imagine and what effectively we can bring the denser Interior meaning. The Brazil deeper or more profound that we are arises from an construction full of mishaps, setbacks and advances. Every day, and, We are no worse or better, but different, more inside of ourselves. And maybe it's valuable to hear the inside of soul, the interior of the heart, the Interior of the country. All interiors, so intense, so rich the contagious joy of a country bathed by the Sun and filled with colors. Worth checking out. ¹ Oscar D ’ Ambrosio is doctor of education, Arts and history of Culture and a master's degree in Visual Arts from Unesp. 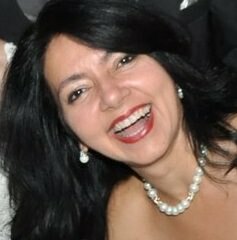 Member of the International Association of art critics (Brazil Section). Name of the artists: Adilson Lee, Ana Andrade, Antônia Hussaini, C. Morari, Cristina Lisbon, Denise Müller, Eduardo Seixas, Elza Carvalho, Francine Trulio, Galina, Gonçalo Borges, Hazel of San Francisco, Iane Zanini, Agnes Victoria, Abdulkareem Mussara Pieratti, Kitty Marie, Liza Ellwanger, Maria Paula Giacomini, Marco Costa, Massako Koga, MF Martina Ficker, Tony, Rafael Murió, Aremi Palero Raquel Iverniz, Regina Franco, Regina Maria of passion, Regina Velloso, Ricardo Alves, Rimaro, Rita Holcberg, Rosa East, Rosangela Vig, Silvana Borges, Silvia Carrano, Simon Abuhab, Help Mota, Tiarô, Vera Bekin, Pascual Vildete, Vilson Pallaro, Zina Kossoy.